I first met Deno in 2010 at work (GGS Timbertop). We were staffed on a hike together, so spent many hours walking and talking through the Victorian High Country. We got along really well and laughed the whole time, but we were both happy in other relationships. We met up again at the start of 2016 through mutual Timbertop friends and it all happened incredibly quickly after that! 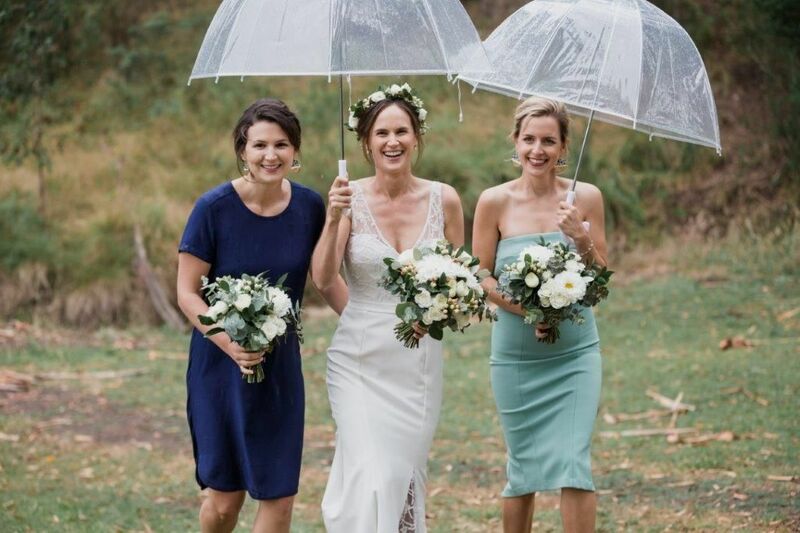 I only had 2 days to find a dress because my mum was going overseas for a number of months, and both of my bridesmaids also live overseas. Bernadette’s was the second boutique we visited. Mum picked the dress out from the rack and I don’t think I ever would have because it looked completely different on me to how it looked on the hanger! I felt amazing in it. 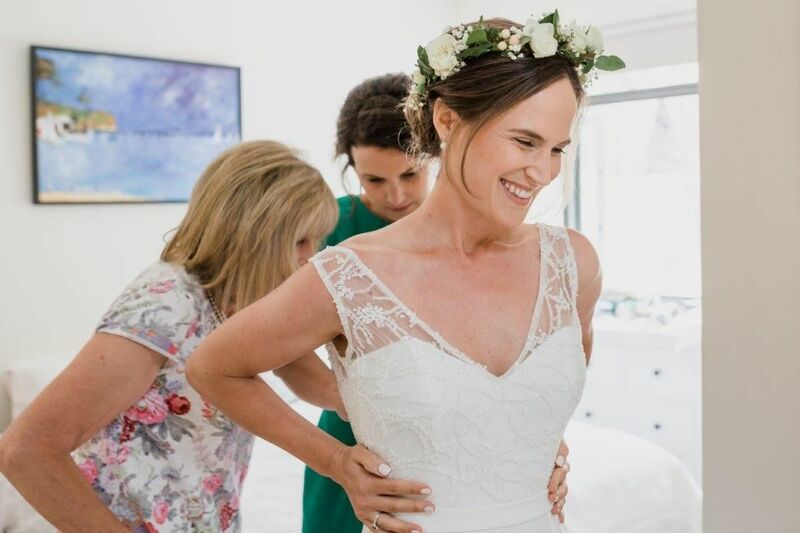 And Bernadette said “I can tell you like it because you don’t want to take it off” and I realised she was right – other dresses I’d tried on and gone “yeah I like it a lot… now I’ll try on this one” but I couldn’t stop looking in the mirror at Bernadette’s! We kept our afternoon appointments and I tried on lots more dresses, but none made me feel as special. So the next day we went back, paid a deposit, and cancelled our remaining appointments! I felt as though she ‘got me’ and worked out my personality and style very quickly. I also loved that with Bernadette, it was one flat rate fee. Other places quote prices excluding alterations, and then charged per hour of labour. As someone who has no idea about dress making, I had no idea what sort of price I was going to end up paying. 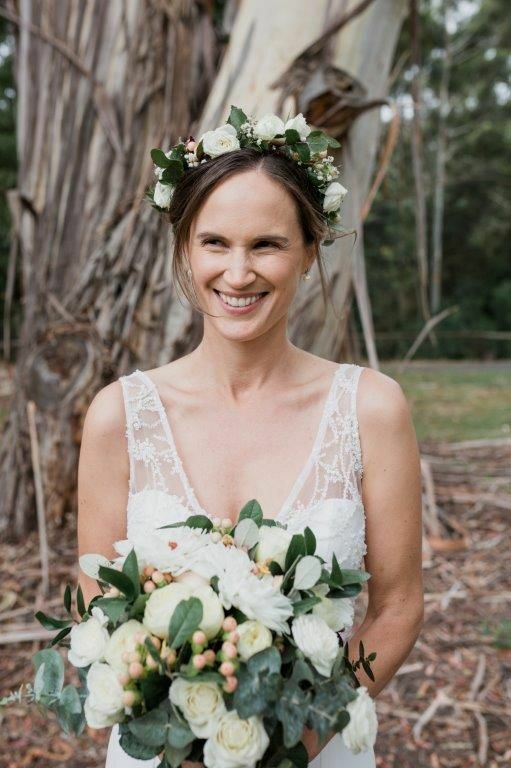 We got married up at Timbertop (Merrijig) because Deno’s from Bordertown in South Australia and I’m from Melbourne – so it was neutral ground. Plus it’s where we live now and where we met. 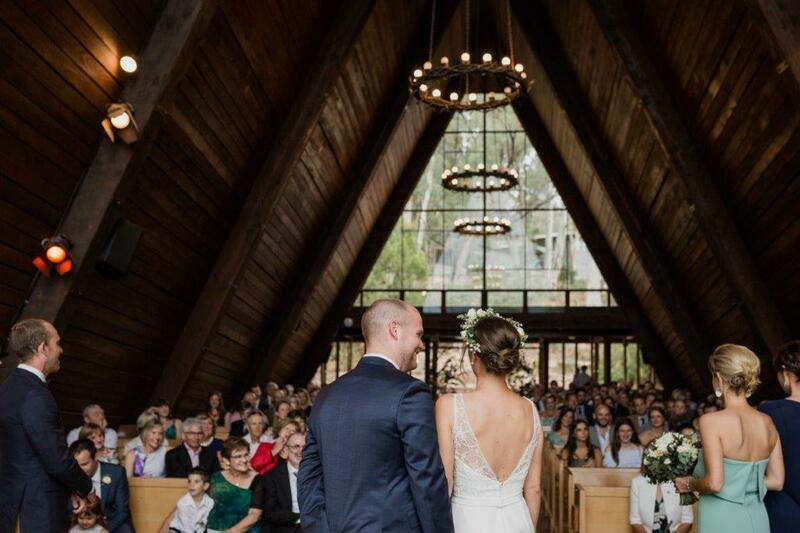 Although neither of us are religious, we chose to get married in the chapel because it is the heart of the campus, where we gather on important occasions as a community, and the most stunning building in the world. 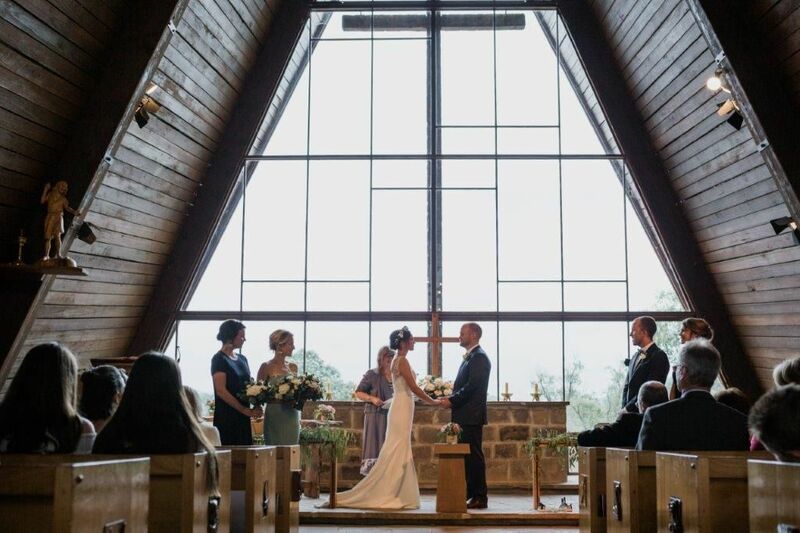 It is A-frame in shape – just like an old-fashioned tent – and it is completely glass at the end so the entire congregation look over the Buttercup Range. Some of the best advice I received was ‘don’t sweat the small stuff’. 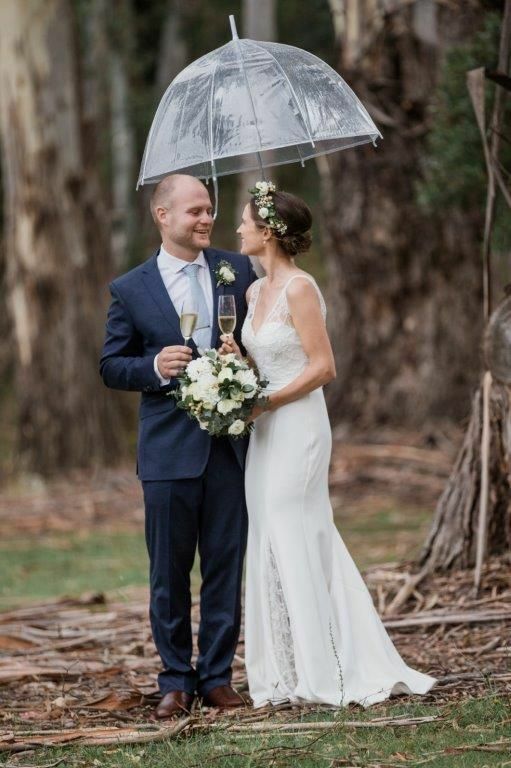 I realised very early on that I was never going to be able to please everyone and for that reason, it was important that Deno and I planned a wedding that was going to be true to us and make us happy. 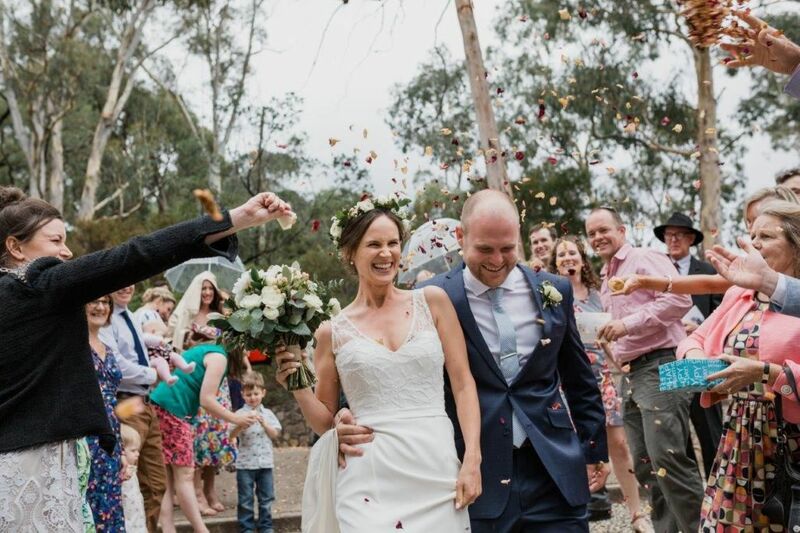 Someone else said to me “every guest at your wedding is going to arrive looking to have a good time” and that is exactly right – people want to have a good time and so they do! Accept help from friends, include as many personal touches as you can, and plan a wedding that reflects you honestly as a couple. We wouldn’t change a single thing about our day. Venue: Timbertop chapel, Merrijig, VIC. Followed by a reception at a private residence on the Delatite River.